Proudly made in the U.S.A. This detailed lockback knife, featuring a durable, die-struck handle and a sturdy stainless steel blade, salutes the unmatched power and precision of the U.S. Marine Corps. Minted in a nickel alloy and coated with an antique finish, the knife handle contains a detailed montage on its face, which honors the the courage and commitment exhibited by every Marine throughout America's history. 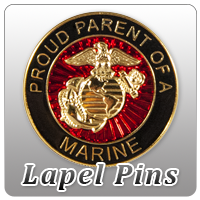 The reverse bears the seal of the U.S. Marine Corps as well as the Marine Corps' famous bulldog emblem.